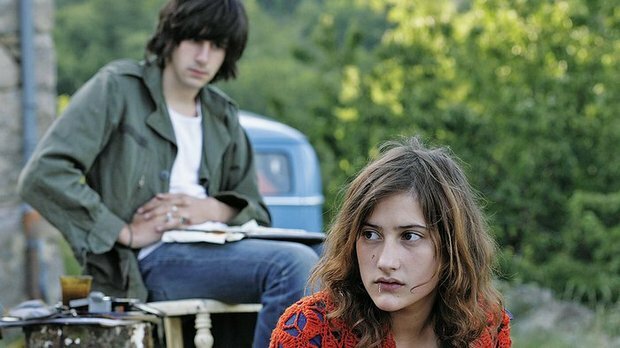 In many ways, Something in the Air is an extension of the conversation that French auteur Olivier Assayas started with his astonishing 2010 masterpiece Carlos. That five-and-a-half hour epic charted the rise and fall of Carlos the Jackel, a terrorist best known for raiding an OPEC meeting in the mid-seventies. There are none as radical as Carlos in Assayas’ latest film, but he is still fascinated by political ideology manifesting itself in physical, and sometimes violent, ways. The teens at the center of the movie begin as anarchists, vandalizing their school and handing out pamphlets about police brutality. Watching the police fire tear gas at and beat them in one of the very first scenes justifies their cause. Assayas doesn’t dwell for very long on their movement. He is toying with the limits of activism here; with the extent people are willing to go to support a cause. Gilles (Clément Métayer) is an aspiring artist and activist, but he also wants to be a filmmaker… maybe. His indecisiveness is of course a by-product of youth, but it also shows Assayas’ own indecision when it comes to the point he wants to make with this material. All of this confusion is rooted in Paris in 1971, three years after intense labor strikes in May of ’68. 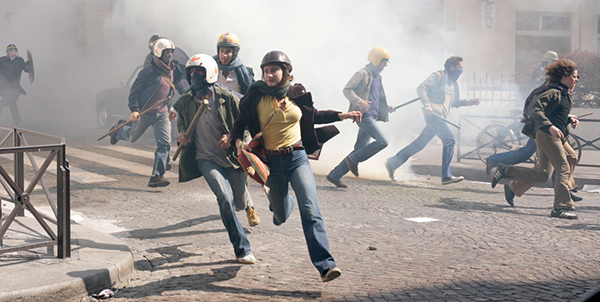 There is still protest going on, but Assayas is showing it to us at a very early and quite innocent stage. Each of the chief characters involved in that opening police beating are forced to compromise political intent with economical reality. Gilles, who Assayas based somewhat on himself, ends up working behind-the-scenes at a sci-fi movie with Nazis bye the end. Christine (Lola Créton), the more engaging of his two love interests, is involved with politically radical documentary filmmakers who she finds to be less open-minded than she thought when it comes to feminism. In between that exhilarating protest sequence and the somewhat sober conclusion is a lot of country-hopping, sexually-inspired art and hair-dos. Assayas is masterful at sustaining atmosphere while still maintaining levels of visual spontaneity. The filming style is rooted in realism, and attuned to the subtleties in the character relationships. None of the performances are showy or outlandish, despite the amount of drugs many of them consume. Gilles is often very quiet, and though he is meant to be a brooding artist, at times his silence and lack of emotion in certain scenarios is more awkward than it is revealing about his character. Thankfully this isn’t a movie that’s dependent on any single character to carry it. Assayas creates a filmmaking rhythm that feels aimless but always arrives at a situation that somehow enriches the characters. I was completely unfamiliar with the labor and social protests that the movie shows the aftermath of, and by the end I didn’t really have more of an understanding about them. What I did have was the sense that I’d witnessed that period in time exactly as Assayas pictured it, from the way the characters move through the world to the way that that world looks. It just didn’t really explore or expand on much else besides that. Directed and co-written with exceptional talent by Bertrand Tavernier, Princess is a period love triangle set amid the turbulent violence of the Catholic/Protestant wars of the 16th century. It opens with an epic sequence of men on horseback slaughtering men on the ground. This image is indicative of the unfair advantages that infect much of the rest of the story, which finds young Marie (Mélanie Thierry) married off to the wealthy prince of Montpensier (Grégoire Leprince-Ringuet) who is given favor over the man Marie truly loves, her cousin Henri de Guise (Gaspard Ulliel). Catherine Breillat is one of the most provocative filmmakers currently working today. Unlike Michael Bay, though, her cinema is provocative because it is endlessly interesting instead of tedious. She creates a beautiful world in Fat Girl, though it is by no means an easy film to watch. On the surface it is an exploration of adolescent female sexuality, but once you peel back the layers it becomes much more than that. In interviews Breillat talks of her fascination with sisters, and how she likes to explore the idea of two bodies sharing a soul. If that is the case than the soul in Fat Girl is very much fractured. Anaïs (Anaïs Reboux) is the title character, a mildly but not extraordinarily obese 12-year-old. We watch her as she watches her beautiful 15-year-old sister Elena (Roxane Mesquida) lose her innocence on a seemingly innocent vacation fling with Fernando (Libero De Rienzo).